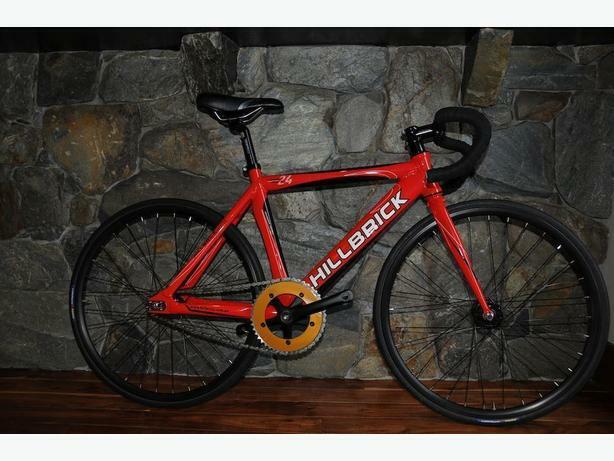 As new, Hillbrick Pista 24" wheel/44cm top tube kid's track bike. Comes with Hillbrick 24" sealed bearing double sided (flip-flop) wheel set, Roselli 16 tooth cog, Sugino Messenger 46t chain ring plus NV 47t chain ring, Roselli seat post, stem and bar, and specialized children specific seat. Rare in North America, kid's sized track bike. Imported from Australia. Used by 9 year old girl at BC Track Cycling Championships, Burnaby Velodrome BC. Will sell for $699 (CAN)+ shipping firm.